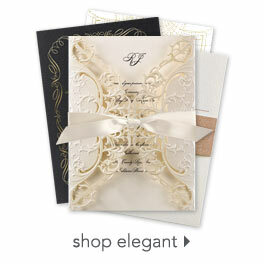 A large band of intricate lace sweeps beside your wording on this very affordable, 3 for 1 wedding invitation. The 3 for 1 wedding invitation includes three pieces - a wedding invitation, response card and reception card - all for one low price. Due to the unique printing process required to offer you this invitation ensemble at a lower cost, all three pieces come on one sheet and are perforated for easy separation. Loved the embossed design and wording! Overall these are nice and affordable invitations. I upgraded to a heavier card stock as well as the shiny outer envelopes. The perforations though are obvious once you detach the 3-in-1 (confirmed with customer service that this should be done and they also claimed no one had ever mentioned this being an issue before). Luckily my sister has a paper cutter so we went through and manually trimmed all the perf-ed edges. Yes it was a pain but for the price it wasn't that big of a deal and they ended up looking fine in the end. My only criticism is to be cautious on the color you choose if the card stock is not white. We selected ecru invites and the color we selected did not show up as it looked in the sample. Thankfully the customer service was very efficient and corrected the issue. Delivery was fast and efficient. Customer service was slightly inconsistent but it all worked out in the end and they righted any problems we had. Great customer service when there was an issue which definitely impacted my overall experience with the company. I am so glad I decided to upgrade to the shimmer paper. They look like very expensive invitations! But they were VERY reasonable! So happy with my purchase. They arrived very quickly! Friends thought they were homemade and loved them. I ordered these invitations on a Wednesday evening and they arrived via UPS on Friday morning. Couldn't believe how fast they came and they are beautiful. I chose the shimmer paper which I highly recommend. I will order my thank you cards from here as well. I am not one to usually write reviews, but I was extremely happy with this product..the quality, the quick delivery, and the price! We just sent our invitations out and our guests love them as well. We have received many compliments! I would (and already have) recommended to friends who are in the wedding planning process. :) Everything was packed neatly and the shipment came in even quicker than I expected! I ordered this in a plum color and it was not a true plum. The purple was very light. The sheets are difficult to pull apart, but the design if beautiful. I was on a budget and they were perfect! This product was very well made. Raised lettering made a world of difference. Thick paper even for the standard stock paper. The coloring was perfect! The service was excellent. I had to call in advance to verify a few concerns I had. The customer service representative was extremely helpful. After my concerns had been laid to rest, I placed the order for a sample. The sample came quickly. After that, I had made up my mind completely and placed an order which came all together and neatly stacked. I would definitely order again for future needs. Our invitations came out beautifully. I loved that I could add or delete lines and customize them the way we wanted to. The writing and design are raised off the page which adds to their beauty. They look like we spent a few hundred dollars on them, but we got a great deal! I loved everything about Invitations by Dawn! The samples .. The prices .. The customer service .. and of course, the final product .. My wedding invitations! I never thought I could get high quality invitations for such a great price. Thank you! The invitations themselves were beautiful. The company was unable to create an ombre effect on the lace design, but the woman I worked with was very helpful and looked into all possibilities for me. Designing the invitations was slightly annoying. I had to delete lines to ensure that the fonts and colors I wanted (black and red) were assigned to the proper text. The colors were vibrant and consistent across the board (something I know another bride had issues with), and the product was exactly what we wanted. That being said, the price for the quantity was ridiculously high, despite using a coupon code. I do not think the price was reflective of what we actually got. This was a nightmare. I placed my order, and the website crashed twice. It said the order had finally placed, and sent me a defunct reference number. When I contacted customer service the next day, the woman I dealt with was rude and cavalier. Her explanation was "Yeah, we were website issues. I don't know what to tell you. You can either reorder or not." I'm so glad that the ridiculous amount of money I was spending was so greatly appreciated, and my inconvenience and frustration were acknowledged. Anyway, the shipping was fast, but when we opened the box, the envelopes were scattered all over the box. It was as if someone just threw them in there. All in all, this will be my last order with this company. The inflated prices, poor customer service, and general sloppiness and apathy in delivering the final product completely turned me off. My advice is that if you cannot find what you are looking for elsewhere, then get what you want from this company. Otherwise, shop around or work with a designer and print elsewhere. The layout of these invites is beautiful, the colors were vivid, and I received lots of compliments. However, out of about 230 invitation sets ordered, probably 20 or so where printed so poorly that they were un-usable. The ink was overlapped and/or faded, lines on the RSVP cards were crooked, lines of text were crowded together or cut off entirely. An additional 25 invitations were also crooked or printed badly, but because we invited over 200 guests to our wedding, we had to use them. I ended up sending them to close family or friends whom I thought would understand or not care, and emailed them an apology ahead of time - not an experience you want to have. Additionally, there were not enough envelopes included; I'm lucky I ordered so many extras! Someone at Invitations by Dawn clearly did not check the printing or the box before it was shipped. Some may argue that 'you get what you pay for', however we still paid hundreds of dollars for these invites. I'm using this opportunity to review (Btw, the fact that Invitations by Dawn promotes this review feature is a credit to the company - which I'm noting in the service section) the invitations as a way to flag the defects to Invitations by Dawn, and have not lodged a complaint with them otherwise. I've given them a 2nd chance by ordering my thank you notes from them as well, so hopefully this was a one-time thing. I had no time to re-order invites before we sent them. So, if you are on a tight timeline, I'd order at least 50 extra invites, or go somewhere else. Very happy with their promotion of the review feature. Not all companies encourage customers to publicly review - so that is a plus. Invites arrived on time, although defective as I've noted in the product comments. Awesome product! We recommend! Thanks! Loved the three for one deal. Also loved how we could customize. Didn't need the reception card so we used it for requesting songs card. Great service and fast shipping!!! We absolutely love these invitations. We were able to change the wording to what we wanted and we love the idea of the 3 in 1!! The quality of the paper and ink are outstanding! I would recommend these to anyone looking for this style. This product is amazing! The quality is top-notch and I can't wait to send them out to our guests! The quality of these invitations were amazing especially considering the cost! I love the detail and the color came out beautifully! The perforation was easy to separate too! High quality product for the price. Competitor's prices were nearly triple the cost. Very happy with my invitations and I'm picky!!! Love all the paper/ink color options they send with samples. Really fast delivery. Very quick proof and extremely quick turnaround with corrections. Beautiful & affordable! So happy with these! I loved the 3 in 1! The quality is awesome! The customer service team was very helpful and nice. The shipping was fast also! I ordered the 3 in 1 invitations for my wedding and they turned out perfect. I priced around many different sites and ended up finding Invitations By Dawn to be the best deal! I even upgraded the paper to the shimmering cardstock and the price was still better than tr competitors. They are just what I wanted and look great! I even noticed a error after I approved my PDF proof and the customer care rep was very friendly and able to help me out with no problems. I will recommend Invitations By Dawn to everyone! These are really beautiful invitations for a very affordable price. The thermography is a great touch and really makes the invitations appear more expensive than they actually were. Unfortunately, my first batch arrived with a noticeable crease down the right side of each one. I called customer service and they immediately reprinted a new batch for free for me, but that new batch arrived with noticeably uneven ink (faded in some places, darkly saturated in others). I called customer service again and they reprinted them again for free and the third batch arrived. These are pretty, but the thermography is almost a matte (was shiny on the original) and the blue is clearly darker than the original batch. Actually, all three versions were different colors of blue even though I was ordering them all the same (see attached picture). So, I'm slightly disappointed with the final product, because it's not quite what I was expecting (given the sample and the first batch), but it's still a great price for a nice invitation. Customer service was incredible. I called twice and got through immediately both times. The customer service agents I spoke to were pleasant, knowledgeable and accommodating. The delivery was exceptionally fast. They had made a mistake during printing and so we called them to see what they could do about it. My fiance was then told we would have to reorder the whole lot of invitations because "we at invitations by dawn don't make mistakes"and the best they could do is 5% off our new order. We had to go to office max and buy even more stuff to fix a mistake that wouldn't have happened if not for this company. Do not purchase from here they will potentially ruin your wedding!! The invitations exceeded my expectations! They arrived very fast and neatly labeled in a box! I showed my cousin who is also getting married, she said they were nicer than hers and she paid double! I'm so glad I chose invitations by dawn! The invitation is simple and elegant. Easy to put together! Fantastic, personal service that is quick! Spoke to an actual team member when I called! Very professional. Thanks for making ordering my invitations so easy! Great experience with you all! I've received nothing but complements!!! As a bride who loves to DIY, I was going to try and design and print my own invitations, especially because I needed 700!!!!! But after seeing these and getting a sample, I knew this was the way to go. I ordered the ecru colored cards with Copper ink. The raised print of the text and design make it seem like you spend more money than you actually did! The Copper ink color is burgundy brown with a gold shimmery ink coating. My only semi complaint is that the gold raised coating was occasionally uneven, but I think it makes each invitation unique. The envelopes are good quality, Everything was very nice and I have been recommending this company to all my new bride friends. I must have called customer service half a dozen times to customize my order. The team there is wonderful! All we so great to talk with. I had some unusual customization requests and they worked to make them all happen. Once I approved the final proof, 708 invitations were printed and shipped within 3 days, and I received them in a timely 4 days later. Overall, I'm very happy with working with Invitations by Dawn. Love the look of these invitations; you really don't notice the perforations unless you are looking really hard. My only wish....that you could personalize one of the cards to something else....e.g. The reception card could be personalized the include other information instead of reception info....other than this.....these cards are exactly what I was looking for. These were so beautiful. The ink was raised, almost like embossed. I did notice 9some of the other reviews noticed too) some black marks on one or two of the cards but I had ordered extra so it wasn't a big deal to me. I had one problem and it was that my inner and outer envelopes were switched in sizes. Customer service was very quick to remedy the situation. It did not put a damper on my experience at all! I never got a tracking number from my products but when I called I was able to get one and the delivery date! Great quality. Fast service. took longer for shipping than printing. But was received well in time for sending. I am very pleased with everything. very impressed by the customer service and price!